650 Staff, students and parents of Tupton Hall Secondary School along with local primary schools came together to not only celebrate the achievements of science, but to raise money for sport relief UNICEF and other charities. 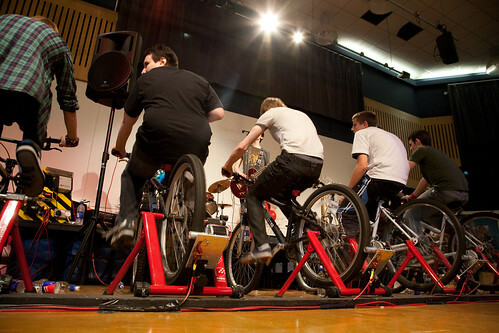 We worked with the Craig bell who is a member of Tupton Hall’s science faculty on coming up pedalled powered installations such as smoothie making, workshops, dance mats, Scalextric and of course the mini power station to power the main stage. All of this went towards a ten hour energy marathon which kept the bands playing all day raising over £2000 as well as generating just over a Kilo-watt hour between them! It was a very long day but really satisfying!